Very unique home, perfect for entertaining. A walled, with security, compound of 3, 12 x 18 lots for a total of 648 square meters of land, that includes: 3 bedrooms, each with it’s own bath (the 1st floor bathroom is handicapped accessible), open floor plan with a Caribbean feel, furnished and ready to move in. Enjoy the rooftop palapa with great views and a bar area. The Pool area has a hotel quality pool with water fall, dining area and it’s own bath and outdoor shower. The Garden is a Mayan inspired reflection area to re charge your batteries and relax. Located in the Corpus Christi neighborhood, this home is truly one of a kind! 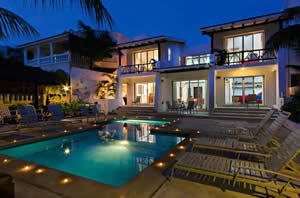 Villa Yak A’Lil is a very large 6 bedroom home located directly on the ocean off the South Coast Highway only 7 miles from town. 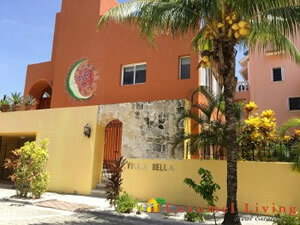 It is the only totally private oceanfront home for sale in Cozumel. The Villa has been an excellent vacation rental. 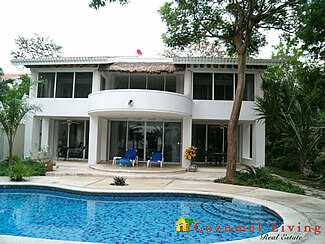 It’s a large home with a wide sandy beach with walk in access to the ocean. There are no other homes around so it is very private and secluded with tons of water sports equipment for you or your guests to enjoy. VERY PRIVATE OCEAN FRONT & ACCESS! 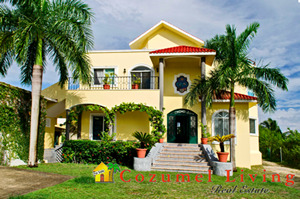 In the gated community of Landmark Resort, there is a home unlike any other in Cozumel. Set in the lush gardens is Casa Verona. 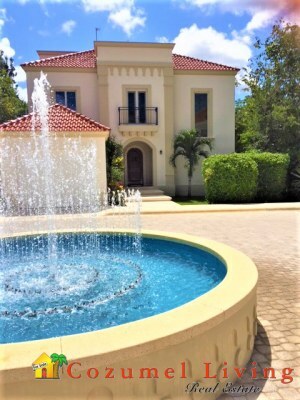 A Medditerranean style luxury home that offers the privacy of home ownership and all of the benefits of a resort lifestyle. This spacious home has 2 bedrooms and 2 and a half baths. It is being sold fully furnished, move in ready, with it's own garage. 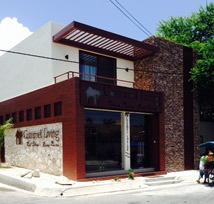 All of the furnishings have been imported to the Island, and the quality of the marble and granite and carpentry is second to none. Casa Verona has the best of both worlds.... accross the street from the ocean, with a VIP seating ocean front, for snorkelling or to watch the sunset, on property there is a gym, tennis and a grill area, jacuzzi and a pool. Enjoy a night at the Money Bar and just cross the street when you are tired from dancing. 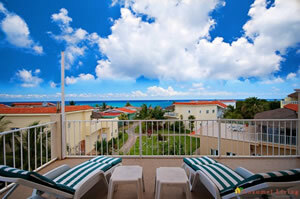 As a resident, all exterior maintenance is taken care of, so you are enjoying paradise trouble free. Don't miss the opportunity , the home is a one in a million. This home is available to see by appointment only. Furnished 5 bedroom, 4 1/2 bath, beachfront home includes a 1 bedroom bungalow/caretakers cottage located at the entrance gate. There is beautiful artwork throughout, a nice swimming pool with palapa covered deck, and plenty of space for entertaining inside and out. Laundry room with washer/dryer, central air conditioning, water purification, softeners, pressure system, and many other amenities including two car covered parking. Beautiful sandy beach just outside your back door, near beach clubs that rent jet skis, have water sports, and restaurants. This prime rental location rents regularly for $4,000/week. 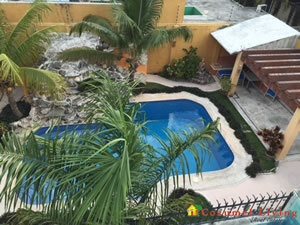 Located in the exclusive Cozumel Country Club in north Cozumel across the street from the golf course in an oceanfront development. Spacious 3 bedroom, open concept living room, dining room, breakfast area, and large kitchen with pantry, laundry room downstairs off double car garage. Gated walkway one house to the ocean on a nice sandy beach. Beautiful pool and front garden with water feature. 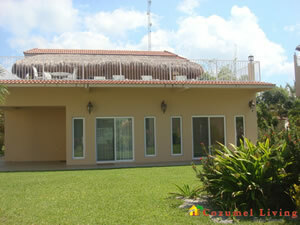 This home currently functions as the owners out of country get away and it would be a great vacation rental property.